ISC is a provider of comprehensive solar energy solutions. Our team manages each of phases of the project, from the structuring, financing, engineering and installation of the solar systems to their operation and maintenance. ISC develops and structures both utility size installations as well as Commercial & Industrial (“C&I”) Rooftop installations. We pride ourselves in working closely with potential offtakers such as utilities and governments in the development, structuring and execution of utility size solar parks. ISC combines rigorous financial, legal and regulatory analysis and works in close collaboration with our technological partners to to successfully execute each project. In addition, ISC offers self-generation system solutions through PV solar modules that produce electrical energy, thus allowing the end user to consume less energy from the electrical grid, which translates into savings for our clients. 1.Systems that are completely financed by Innova and its strategic partners, through a PPA (Power Purchase Agreement). Innova has the capacity to finance self-generation solar energy systems for clients with a solid credit profile. 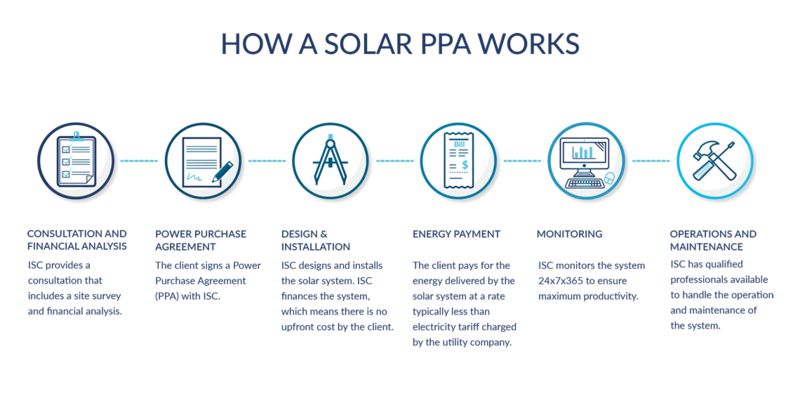 Our team has experience in large-scale PV installations (grid-connected systems, off-grid systems and hybrid systems) and it can manage the development, structuring and financing of these types of systems. 2.Turnkey solutions for clients who prefer to purchase the system themselves. The ISC team in Colombia has the capacity to design, install, operate and maintain our client’s self-generation solar energy systems.